★★★ Written specifically for SAMSUNG phones ★★★ Have you everwanted to know the Country of Origin behind the label 'MADE BYSAMSUNG'? When the phone was manufactured? How frequently the phonewas used? How many times it has been connected to the Charger? Doyou want to know the Knox Warranty Void status without entering tothe ODIN Download Mode?... Then this app is for you. ☆ Supportmulti-language: العربية, Azərbaycanca, Deutsch, English, Español,فارسی, Français, Magyar, Italiano, עברית, 日本語, Polski, Português,Română, Русский, Shqip, Српски, Türkçe, Tiếng Việt, 繁體中文, 简体中文.Please help to translate into your native language:https://www.dropbox.com/s/f52eleg186s41bz/Phone_INFO_Language.txt?dl=0☆ Like Facebook page: https://www.facebook.com/phoneinfosamsung/ ☆Join Facebook group:https://www.facebook.com/groups/phoneinfosamsung/ ☆ XDA thread:http://forum.xda-developers.com/showthread.php?t=2609045 ★ SecretCodes: List all of Samsung secret codes (HiddenMenu) on yourdevice. Note: You may need ROOT to launch secret codes (use 'Launch0' method). ★ Firmware Browser: Browse for the stock firmwaresavailable online, for your phone and for any other Samsung model. ★Other Tools: - CSC Changer: Change the CSC. This tool requires root+ multi-CSC stock firmware. - CSC Verifier: It is Samsung built-intool. Requires root + stock firmware. - ServiceMode MAIN MENU: Itis Samsung built-in tool. Requires root + stock firmware. 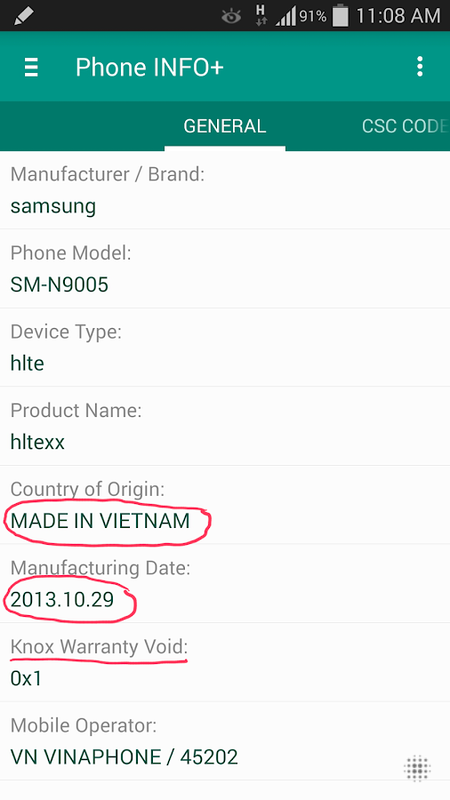 - S/NAnalyzer: Obtain information about Country of Origin andManufacturing Date from Samsung serial number. You can enter serialnumber from ANY Samsung phone (including OLD phone, FEATURE phoneand NON-SMART phone). - IMEI Analyzer: Check the IMEI for thevalidity by calculating the Check Digit (according to Luhnalgorithm). ★ Refurbishment Check ★ CSC Code Lookup (CSC - ConsumerSoftware Customization, aka Sales Code, or Region Code) ★ MainFeatures: Displays the following information about your phone. ▪GENERAL INFO: - Manufacturer / Brand - Phone Model / CommercialModel Name - Device Type - Product Name - Country of Origin -Manufacturing Date - Knox Warranty Void - Colour / Internal Storage▪ CSC INFO: - Product Code - Original CSC Code - Firmware's CSCCode - Active CSC Code - Available CSC Codes - CSC Country - MobileOperator ▪ FIRMWARE INFO: - Bootloader Version - PDA Version - CSCVersion - Baseband Version - Latest Firmware - Firmware UpdateHistory - Firmware Status - Kernel Version / Architecture(32/64-bit) - Java Virtual Machine (Dalvik or ART) ▪ OS INFO: -Root Existence - Android Version - Build Number - Build Fingerprint- Build Description - Build Date - Changelist ▪ HARDWARE INFO: -Hardware / Board (CPU 32/64-bit) - Platform / Chip - GPU (GraphicsProcessing Unit) - Modem Board - Hardware Revision - Total RAM -Screen (physical size in inches, resolution in pixels, density indpi and ppi) - Camera - Sound Card - Mono or Stereo Loudspeaker -WiFi Chip - GPS Chip - Battery (technology, capacity in mAh) -Sensors ▪ DEVICE ID: - IMEI (support dual SIM) - Android SerialNumber - Samsung Serial Number ▪ USAGE HISTORY: - Headset ConnectCounter - Charger Connect Counter - S Pen Detach Counter - BatteryDischarge Cycles - Battery Health ▪ MONITOR: - CPU/Battery/Ambienttemperatures - CPU/Memory usages - Battery voltage/level - Signalstrength NOTE: This app works properly with Stock Firmware. OnCustom ROM some info may not show correctly. ☆☆☆ Ability to RemoveAds and Export info to the SD Card (Plus version only) ☆☆☆ ABOUTPERMISSIONS: - Camera: This permission is required to read thecamera resolution. - Read Phone State: This permission is requiredto read IMEI, and also serial number (on Android 8.0+). IMEI Analyzer is a powerful tool for IMEI Analyzing, IMEI Checkingand IMEI Calculating.- IMEI Checking:Check whether the given IMEI(15-digit number) is valid or not by calculating the Check Digit(using Luhn algorithm) and then comparing with the Check Digit ofthe given IMEI. There is also the option that allow you to fetchdata (Brand and Phone Model) from the popular websitewww.imei.info.- IMEI Calculating:You can enter the IMEI without theCheck Digit (only 14 digits) and this app will calculate the CheckDigit by using Luhn algorithm.- IMEI Analyzing:Breakdown the IMEIinto the following parts:• Type Allocation Code (TAC)• ReportingBody Identifier (RBI)• Mobile Equipment Type Identifier• FinalAssembly Code (FAC)• Serial Number• Check DigitMore info aboutIMEI:IMEI stands for International Mobile Station EquipmentIdentity. The full IMEI number is 15 digits in length. You canobtain the IMEI by open the phone's dialpad and enter *#06*. Or youcan see it in the label on the back of the phone, behind thebattery. ★★★ Written specifically for SAMSUNG phones ★★★ Have you everwanted to know the Country of Origin behind the label 'MADE BYSAMSUNG'? When the phone was manufactured? How frequently the phonewas used? How many times it has been connected to the Charger? Doyou want to know the Knox Warranty Void status without entering tothe ODIN Download Mode?... Then this app is for you. ☆ Supportmulti-language: العربية, Azərbaycanca, Deutsch, English, Español,فارسی, Français, Magyar, Italiano, עברית, 日本語, Polski, Português,Română, Русский, Shqip, Српски, Türkçe, Tiếng Việt, 繁體中文, 简体中文. Ifyou want to help to translate into your native language, here isthe language file:https://www.dropbox.com/s/f52eleg186s41bz/Phone_INFO_Language.txt?dl=0☆ Like Facebook page: https://www.facebook.com/phoneinfosamsung/ ☆Join Facebook group:https://www.facebook.com/groups/phoneinfosamsung/ ☆ XDA thread:http://forum.xda-developers.com/showthread.php?t=2609045 ★ SecretCodes: List all of Samsung secret codes (HiddenMenu) on yourdevice. Note: You may need ROOT to launch secret codes (use 'Launch0' method). ★ Firmware Browser: Browse for the stock firmwaresavailable online, for your phone and for any other Samsung model. ★Other Tools: - CSC Changer: Change the CSC. This tool requires root+ multi-CSC stock firmware. - CSC Verifier: It is Samsung built-intool. Requires root + stock firmware. - ServiceMode MAIN MENU: Itis Samsung built-in tool. Requires root + stock firmware. - S/NAnalyzer: Obtain information about Country of Origin andManufacturing Date from Samsung serial number. You can enter serialnumber from ANY Samsung phone (including OLD phone, FEATURE phoneand NON-SMART phone). - IMEI Analyzer: Check the IMEI for thevalidity by calculating the Check Digit (according to Luhnalgorithm). ★ Refurbishment Check ★ CSC Code Lookup (CSC - ConsumerSoftware Customization, aka Sales Code, or Region Code) ★ MainFeatures: Displays the following information about your phone. ▪GENERAL INFO: - Manufacturer / Brand - Phone Model / CommercialModel Name - Device Type - Product Name - Country of Origin -Manufacturing Date - Knox Warranty Void - Colour / Internal Storage▪ CSC INFO: - Product Code - Original CSC Code - Firmware's CSCCode - Active CSC Code - Available CSC Codes - CSC Country - MobileOperator ▪ FIRMWARE INFO: - Bootloader Version - PDA Version - CSCVersion - Baseband Version - Latest Firmware - Firmware UpdateHistory - Firmware Status - Kernel Version / Architecture(32/64-bit) - Java Virtual Machine (Dalvik or ART) ▪ OS INFO: -Root Existence - Android Version - Build Number - Build Fingerprint- Build Description - Build Date - Changelist ▪ HARDWARE INFO: -Hardware / Board (CPU 32/64-bit) - Platform / Chip - GPU (GraphicsProcessing Unit) - Modem Board - Hardware Revision - Total RAM -Screen (physical size in inches, resolution in pixels, density indpi and ppi) - Camera - Sound Card - Mono or Stereo Loudspeaker -WiFi Chip - GPS Chip - Battery (technology, capacity in mAh) -Sensors ▪ DEVICE ID: - IMEI (support dual SIM) - Android SerialNumber - Samsung Serial Number ▪ USAGE HISTORY: - Headset ConnectCounter - Charger Connect Counter - S Pen Detach Counter - BatteryDischarge Cycles - Battery Health ▪ MONITOR: - CPU/Battery/Ambienttemperatures - CPU/Memory usages - Battery voltage/level - Signalstrength NOTE: This app works properly with Stock Firmware. OnCustom ROM some info may not show correctly. DONATED (Plus)FEATURES: ☆ Ad-Free ☆ Export info to the SD Card ABOUT PERMISSIONS:- Camera: This permission is required to read the cameraresolution. - Read Phone State: This permission is required to readIMEI, and also serial number (on Android 8.0+). A complete IMEI/EFS Backup and Restore solution for (almost) ALLSamsung devices.This app should work with almost ALL Samsungdevices -- including new Galaxy S7, S7 Edge, S6, S6 Edge, S6 EdgePlus and all Note5 variants, Note 4, Note 3, Note 2, S5, S4, S3,etc...Prerequisite: SAMSUNG device + ROOT permission.Make sure youown a SAMSUNG device and your device has been ROOTED beforepurchase. ** NOTE 1 **: This app may not work on some custom ROMs. ** NOTE 2 **: If you are using Android 4.4 (KitKat) and you cannotbackup to the External SD card, you can use SDFix app to fix:https://play.google.com/store/apps/details?id=nextapp.sdfix** NOTE3 **: This app requires an Internet connection for Google Playlicense checking. If you lost the IMEI, your mobile data connectionmay not function. In that case, you have to connect to the Internetvia WiFi for this app to work.DESCRIPTION:This app will make a fullbackup for the EFS partition and all other IMEI-related partitions,e.g. MODEMST, MODEMST1, MODEMST2, M9KEFS, M9KEFS1, M9KEFS2,M9KEFS3... (these partitions will vary from device to device)Itwill perform cross-checks to make sure a good backup was made andensure the backup is suitable for your device beforerestoring.DURING BACKING UP PROCESS:- Auto detect which partitionsto back up- Check if all needed partitions have been backed up-Check if all partitions are backed up correctly by comparing thefile size to the partition size- Generate and save MD5 checksum forbackup files- Save all the system properties for restoring purpose,e.g. phone model, product name, OS version, partition structure,partition size...DURING RESTORING PROCESS:- Compare savedproperties with the current system properties: phone model, productname, OS version...- Compare partition structure and partition sizeto ensure that the backup is suitable for your device- Compare theMD5 checksum for the backup filesThe good item will be marked with[✔] and the bad/mismatched item will be marked with [✘].HOW TO BACKUP:• From the main screen, tap Backup button to make a backup.• Youwill be asked for backup location, if more than one storagelocation on your device.• You can enter a short description for thebackup.• The app will automatically detect all partitions need toback up.• After backup it will compare the file size and generatethe MD5 checksum.• It also save important system properties.• Thebackup files will be saved in the folder in the following format:IMEI_Backup_yyMMddHHmmssHOW TO RESTORE:• Select the desired backupin the list.• It will show you all information: Details,Properties, Backup Files and Status.• Details: Backup location,size, date created and description.• Properties: Manufacturer,Model, Product name, OS version, partition structure and partitionsize.• Backup Files: shows all backup files and their status. Itwill show the file size if the file is in good condition. Otherwiseit will show 'file not found' or 'bad checksum' etc.• Status:Overall status of the backup. 'Unsuitable' means some properties donot match with the current device, but you still can use it torestore. 'Unusable' means you cannot restore this backup. Thishappens when the partition structure or partition size mismatched,file not found or bad MD5 checksum.• Tap Restore button to restore.Type 'yes' to confirm.• Reboot your device after completerestoring.Supporting thread:http://forum.xda-developers.com/general/paid-software/app-root-imei-backup-samsung-samsung-t2836827WARNING:Only restore when you really need it. Do not play around with thistool. Use at your own risk.P.S: Known working Note 4 variants:SM-N910A, SM-N910C, SM-N910F, SM-N910FD, SM-N910FQ, SM-N910G,SM-N910H, SM-N910K, SM-N910L, SM-N910P, SM-N910R, SM-N910S,SM-N910T, SM-N910U, SM-N910V, SM-N910W8. This app requires a Samsung device... Check the status of your KnoxWarranty bit. Flashing an unofficial ROM/firmware can trigger Voidstatus. This app is for informational purposes only, Knox statuscannot be changed! The app is compatible down to Jelly Bean,although in early versions of Jelly Bean Knox is not present. Thisis in case you have a KitKat bootloader with Knox but manuallydowngraded the operating system to Jelly Bean. 0x0 = valid0x1 =void More information about what Samsung Knox is can be foundhere:https://www.samsungknox.com/en/blog/about-rooting-samsung-knox-enabled-devices-and-knox-warranty-void-bitNOTE: IT IS NOT POSSIBLE TO CHANGE KNOX VOID STATUS! Please do notdownload this app expecting to change your warranty status. That isnot the app's function, nor is it possible. If you have any issueswith this app, please e-mail me before leaving a bad rating. Mygoal is for it to be as accurate and reliable as possible on allKnox-equipped Samsung devices. Night Mode for Samsung is designed first for Samsung smart phonesmodels which lack of screen adjustment function. Night Mode givesyou additional functionality for controlling of screen brightnessand works perfectly. This app allows you to decrease screenbrightness lower than you can achieve on Samsung phone's defaultsettings. Night Mode for Samsung app will give comfort to your eyeswhile reading and using your phone in dark places. This also savesyour some battery energy. Also do not forget to do some researchrelated on "Could Using Your Phone At Night Lead to Blindness? "Note: this app shows you little banner at the bottom of the screen.This helps us to keep and improve our app. We do not collect, harmor use your battery at the background. "The best Samsung screendimmer app." You can browse and play video contents. It also provides clear andstraightforward layout, when you select Samsung Video Player forplaying video clip, it may provides seamless user experience. [Major Features] ■ Viewing □ Videos / Folders Tab □ List / GridView □ Search □ Sort by - Title / Time □ Sort by Order - Ascending/ Descending □ Support pinch to zoom - Using multi-touch you canenlarge thumbnails □ File Tag (360 video, DRM, Slow motion andHyperlapse video) □ Resume position card - It shows the last videoyou played ■ Managing □ Provides Editor/Delete on video content(Youcan download Video Editor) □ You can share video content withfriends via various sharing functions that device supports - Email,Bluetooth, Wi-Fi Direct, YouTube ... □ You can select and movecontents if multiple folder exists □ You can rename a file □ Youmay select video content then delete or make it private** ** -'Private' functionality available if the device supports any of thefollowing : Secure Folder, Private Mode or KNOX service. *Supported device : Samsung Galaxy Series (some models are notsupported due to hardware dependency) *********Regarding the AppAccess Privilege********* To provide quality service, the app needsbelow app access privilege. You can use basic function of appwithout consent of Optional App access privilege. - MandatoryAccess Privilege . Storage: The purpose is to access/manage localvideo files. In this world most of the people doesn't afford expensive, luxuryand new mobile phones, so they purchase used or second hand mobilesfrom different classified platforms like Olx, eBay, Amazon. So thisapp is basically designed for those people who buy used mobiles tocheck each and every feature of their mobile phones before buying.PhDoctor (Phone Doctor) will completely test your mobile and ensureyou about each feature of your mobile and save you from any kind ofcheat or fraud.Design of phone doctor is very simple and easy touse. A normal lay person can easily understand that how to checkhardware and a software of a mobile. Main Features: ▶ DeviceDetail▶ Phone Report▶ Refurbishment▶ Hardware Test▶ Network Test▶Other Tests★ Device DetailThis feature includes detail of devicehardware, software and battery. PhDoctor (Mobile checker) willautomatically detect the following details of your device:☆Hardware detail includes:▶ Manufacture▶ Model▶ Brand▶ Board▶ Screensize▶ Screen resolution▶ Screen density▶ Total RAM▶ Available RAM▶Total storage▶ Available storage☆ Software detail includes:▶Android version▶ API level▶ Build id▶ Java VM▶ OpenGL ES▶ Kernalversion▶ Kernal name▶ Kernal architecture▶ Root access▶ Systemuptime☆ Battery detail includes:▶ Battery health▶ Battery level▶Power source▶ Status (charging/discharging)▶ Technology▶Temprature▶ Voltage★ Phone ReportThis feature will generate a fullfledged mobile report including device detail, hardware detail andsoftware detail. You can use this report as a image on classifiedplatforms (Olx, ebay, Amazon e.t.c) and share with your phonebuyer. Following are the basic test:▶ Microphone test▶ Receivertest▶ Vibration test▶ Main camera test▶ Front camere test▶Accelerometer sensor test▶ Gyroscope sensor test▶ Proximity sensortest▶ Light sensor test▶ Compass test▶ Touch Screen (Multi-fingers)test▶ Hard Keys (Volume, Power, home and back keys) test▶ FlashLight test▶ Speaker test★ RefurbishmentThis feature of Mobile PhoneTester will check your mobile is refurbis or original.Note: Resultof this feature may not authentic and accurate.★ Hardware TestThisfeature includes manual mobile phone testing. User can easily testeach and every hardware of mobile by just one click. Following arehardware tests:▶ Colors test (Red, Green, Blue)▶ Light dimmingtest▶ Microphone test▶ Receiver test▶ Vibration test▶ Main cameratest▶ Front camere test▶ Accelerometer sensor test▶ Gyroscopesensor test▶ Proximity sensor test▶ Light sensor test▶ Compasstest▶ Touch Screen (Multi-fingers) test▶ Hard Keys (Volume, Power,home and back keys) test▶ Flash Light test▶ Speaker test★ NetworkTestThis feature includes all details of mobile phone related tonetwork. You can easily check signals strength of your device.▶Network operator▶ Sim operator▶ Network type▶ Network strength▶Network code▶ Country code▶ Roaming▶ Network data state★ OtherTestsThis feature includes IMEI test of your mobile phone throughwww.imei.info. You can easily copy your phone IMEI and paste it tocheck all details of device.★ Note: The icons used in this app arefreely available in the public domain, if you believe we have madean error. Please write to us at [email protected] and we willremove that icon. Samsung Music is optimized for Samsung android device and providesa powerful music play functionality and the best user interface.Key Features 1. Supports playback of various sound formats such asMP3, WMA, AAC, FLAC. 2. Helps to effectively manage song lists bycategories. (Track,Album,Artist,Genre,Folder,Composer) 3. Supports anew user experience that easily interact with Samsung smart deviceslike Tablet,TV(DLNA,Screen mirroring),Wearable. 4. Provides a cleanand intuitive user interface. 5. The Samsung music showsrecommendation of playlists from Spotify. You can find Spotifyrecommendation music by Spotify tab and search Spotify music you’lllove. (The Spotify tab is only available in countries where Spotifyis on service.) What is FLAC? FLAC is an audio coding formatsimilar to MP3 & AAC, but lossless, meaning that audio iscompressed in FLAC without any loss in quality. *** Required AppPermissions *** Below mandatory permission is required for basicfeatures of Samsung Music. Even if optional permission are denied,basic features may work properly. [Mandatory Permission] 1. STORAGEpermission : - Allows the player to write,modify,delete to SD card.- Allows the player to read data from SD card. 2. PHONE permission: Korean devices only. - Allow to access phone number for checkingupdate version. [Optional Permission] 1. MICROPHONE permission :Galaxy S4, Note3, Note4 only - Allows to control the player withvoice commands which are listening, not recording. ex :PLAY,PAUSE,NEXT,PREVIOUS,VOLUME UP,VOLUME DOWN 2. CONTACTSpermission - To get Samsung Account information. - Galaxy S7/S8/Note8/S9/Note9 owners: Tap [Settings] > [Cloudand accounts] > [Smart Switch] to open Smart Switch Mobile. *Smart Switch Mobile is already preloaded on GalaxyS7/S8/Note8/S9/Note9 device. ▣ Smart Switch gives you the freedomto move your contacts, music, photos, calendar, text messages,device settings and more to your new Galaxy device. Plus, SmartSwitch™ helps you find your favorite apps or suggest similar oneson Google Play™. ▣ Who can transfer? • Android™ owners - Wirelesstransfer: Android 4.0 or higher - Wireless transfers from acompatible Android device to Galaxy device: Android 4.0 or higher(Note that non-Samsung devices with Android versions lower than 6.0can only connect with Galaxy devices that support a mobile AP.) -Wired transfer: Android 4.3 or higher, charger cable, and a USBconnector • iOS™ owners - use the option that’s best for you: -Wired transfer from your iOS device to your Galaxy: iOS 5.0 orabove, iOS device cable (lightning or 30 pin), and a USB connector- Import from iCloud™: iOS 4.2.1 or higher and Apple ID - PC/Mactransfer using iTunes™: Smart Switch PC/Mac software – Get startedhttp://www.samsung.com/smartswitch • BlackBerry™ owners - Wirelesstransfers: BlackBerry OS 7 or 10 (Mobile AP) - Wired transfer fromyour BlackBerry device to your Galaxy: BlackBerry OS 7 or 10 fortransfers via USB connector • Windows™ Mobile owners - Wirelesstransfers: Windows OS 8.1 or 10 * Note: For more information andstep-by-step directions, go to http://www.samsung.com/smartswitch ▣What can be transferred? - Contacts, calendar(Device content only),messages, photos, music (DRM free content only, Not supported foriCloud), videos (DRM free content only), call logs, memos, alarms,Wi-Fi, wallpapers, documents, app data (Galaxy devices only), homelayouts (Galaxy devices only) - You can send app data and homelayouts by upgrading your Galaxy device to M OS (Galaxy S6 orhigher). ▣ Which devices are supported? • Galaxy: Recent Galaxymobile devices and tablets (From Galaxy S2) * Note: For Galaxy S2,old OS (GB/ICS) version can cause incompatibility. If your S2 doesnot work properly, please try after firmware update. • OtherAndroid devices: - HTC, LG, Sony, Huawei, Lenovo, Motorola,PANTECH, Panasonic, Kyocera, NEC, SHARP, Fujitsu, Xiaomi, Vivo,OPPO, Coolpad(DazenF2), RIM(Priv), YotaPhone, ZTE(Nubia Z9),Gionee, LAVA, MyPhone(My28s), Cherry Mobile, Google(Pixel/Pixel2) *Note: For reasons such as compatibility between devices, it may notbe possible to install and use Smart Switch on certain devices. 1.To transfer data, both devices must have a minimum of 500 MB freespace in their internal memory. 2. If you are using a wiredconnection, your device must support a 'Transferring media files(MTP)' USB option to allow content to be transferred. 3. If youhave a non-Samsung device that constantly disconnects from thewireless network, go to Advanced Wi-Fi on your device, turn off the“Wi-Fi initialize” and “Disconnect low Wi-Fi signal” options, andtry again. (The options described above may not be available,depending on your device manufacturer and OS version.) ※Application permissions The following permissions are required forthe app service. [ Required permissions ] . Phone: Used to transfercall log data . Contacts: Used to transfer contacts data .Calendar: Used to transfer calendar data . SMS: Used to transferSMS data . Storage: Used to save the files necessary for datatransfer . Microphone: Used for high-frequency audio when searchingfor Galaxy devices. . Location: Used to connect Galaxy devicesusing Bluetooth. If your system software version is lower thanAndroid 6.0, please update the software to configure Apppermissions. Previously allowed permissions can be reset on Appsmenu in device settings after software update.